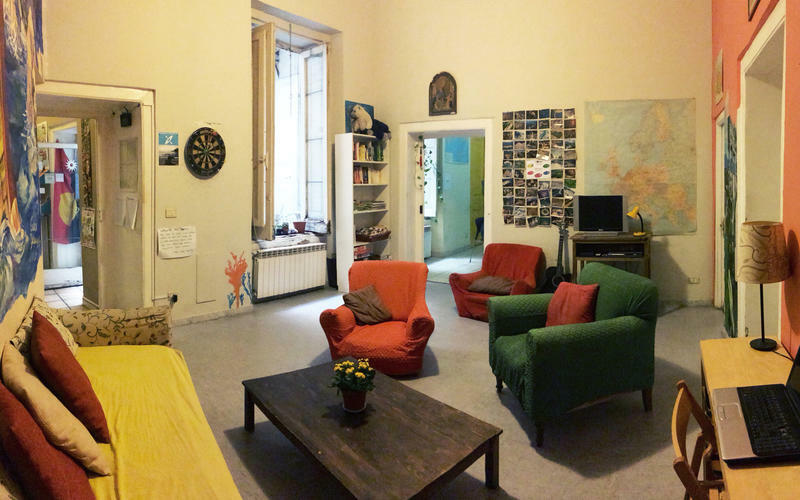 The most centrally located hostel in Naples is clean, safe, and friendly. Not too big and not too small great place it's a great place to meet fellow travelers and relax. We have large rooms, no bunk beds, huge kitchen, free breakfast, great staff, and once again the best location in the entire city. Just off of the bustling thoroughfare of Via Toleda, with its fashionable Italian Boutiques, Cafes, and Gelato shops is a typical narrow street of Naples where laundry hangs out of every window. Inside one of these buildings made of volcanic stone is our hostel; clean, welcoming, and charming. A place we strive to make comfortable, safe, and dynamic for everyone; somewhere you can interact and relax. Despite the name the rooms are actually large, bright and airy. 5 meter high ceilings keep the rooms cool in the summer and the 3 meter tall windows provide sunlight and plenty of fresh air. There are no bunk beds and plenty of space, including lockers, so you can stretch and reprise from your travels, while getting a good night sleep. We also offer inexpensive private rooms if you need a place to your self. Our large communal kitchen is incredible and fully equipped so whether you are preparing snacks for the day or making dinner for the entire hostel everything is available for your use. There is also breakfast in the morning and you can help yourself to Italian espresso and tea from 8 in the morning until 11 in the evening. We have a large selection of DVD's as well if you prefer to relax in the Hostel as well. 6 Small Rooms location is the key to uncovering the many layers of Naples history, while experiencing its exciting contemporary culture. We are only 200m from Piazza Gesu, the main entry point for the historical center and we are 100m from via Toledo/via Roma, the main thoroughfare of contemporary Naples. You will pass the original historical center, built during Geek antiquity nearly 3,000 years ago and monuments dating from during 19th Century as you venture to and from 6 small rooms. You will be within walking distance to all the important monuments of Naples, stone buildings of 18th century, Castel San Martino with spectacular views of the city, the National Archaeological museum, and many more famous and contemporary sites. Though the subway is quite good and located very near the hostel, walking is by far the best way to move around the busy streets of Naples and visit all the amazing sites and our hostel is the best location for walking. If you desire to explore the entire Bay of Naples (Pompeii, Capri, Procida, Sorrento, Almafi Coast) you will be in an excellent location to access local boats, trains, and buses to visit all these popular places. At night you can go out to one of the many local lively piazzas full of students, interesting bars, cheap delicious street food, and historical monuments. There is a wonderful piazza only 50 meters away with a beautiful fountain in front of a monumental building that now operates as a major police station. You can relax and enjoy the evening with drinks, fellow guests, and locals in the shadow of the hostel; knowing that you are in one of safest location in the entire city. 6 Small Rooms is managed by three artist friends, (Italian, French and American) who lived together in Naples and now wish to share the beauty of the city with everyone. As citizens and tour guides we can offer insight that you wont be able to find anywhere else. you are staying with us to explore Naples history, relax at a beach, or meet the locals we are here to provide assistance and direction to make your time in Naples as you desire. From Central Station (Piazza Garibaldi) take the Metro (Linea 2) one stop to Piazza Cavour, change to Linea 1 and go one stop again to Piazza Dante. Take the exit directly in front of you and at the top of the escalator head to your left down Via Toledo (Via Roma, same thing), don't take the the fork which goes off to the left stay straight and take the 2nd street to the left after the fork, Via Tomaso Senise, and then first right into Via Diodato Lioy. Look for number 18. From the airport take the Alibus which leaves outside arrivals every half hour. The bus will stop first at the station then it will go onto Piazza Municipio(The port). From there walk up to Via Medina, which is on your right. Follow it along and after the lights it will become Via Monteoliveto. About 200 mt up on the left you will come to Piazza Monteoliveto. Walk into the Piazza, behind the fountain and on the right is a little narrow street, Via Diodato Lioy. Look for number 18.